an impressive collection of applications that support self-study, like 3D Graphing, Geometry, eActivity for creating discovery based lessons and lots more. 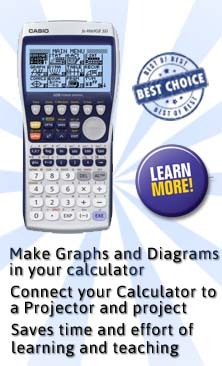 Additional features of the ClassPad 330 include upgraded CAS Technology and Geometry Application, new AP Statistics functionality, and three new applications: Differential Equation Graph, Financial and Probability. and other expressions in the same format as that used in mathematics texts.